In 1971 a group of revolutionary dope-smoking hippies occupied the deserted old military post in the part of town called Christianhavn. 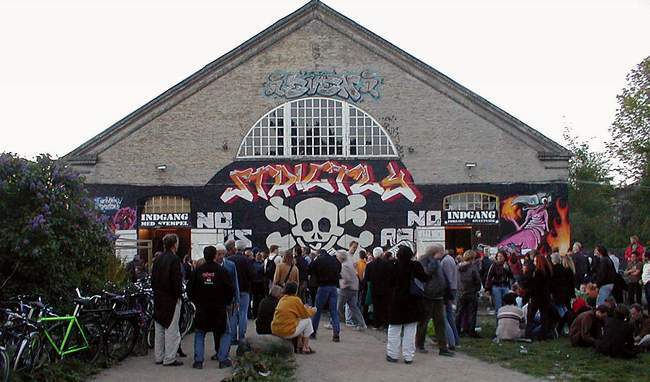 This was in protest to a lack of housing for young people in København-- which has always been a problem here, and still is --the barracks and halls had been empty and unused for many years, going to waste, so about 700 hippies just tore down the barricades and moved in. The government got ready to throw them out with force, then decided to let them stay, as a social experiment. They're still there more than 35 years later, an alternative society among the bourgeoise. 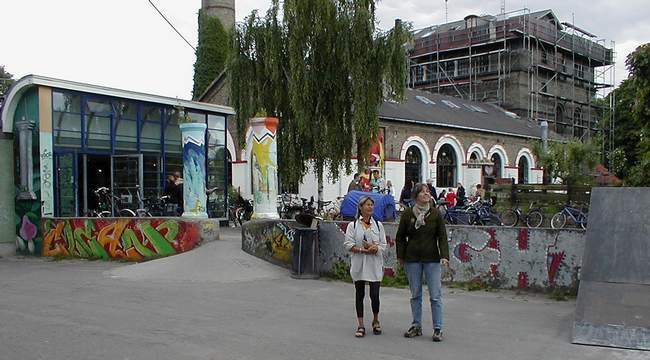 Christiania is a hippy city, very colorful, grafitti abounding everywhere, murals, radical architecture. 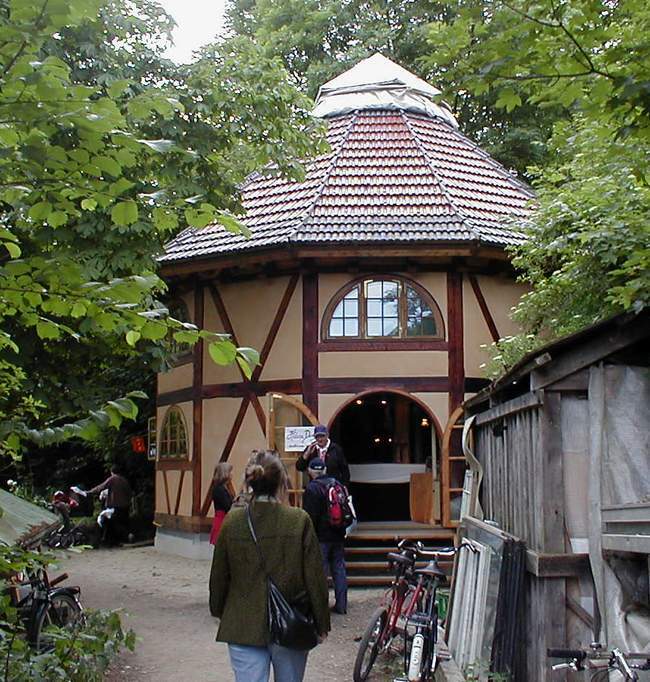 Pyramids, geodesic domes, a "Banana House", there's a lot to see wandering around the area. It's also mostly green forest, lakes, a nature reserve tucked away in the heart of a major European city. 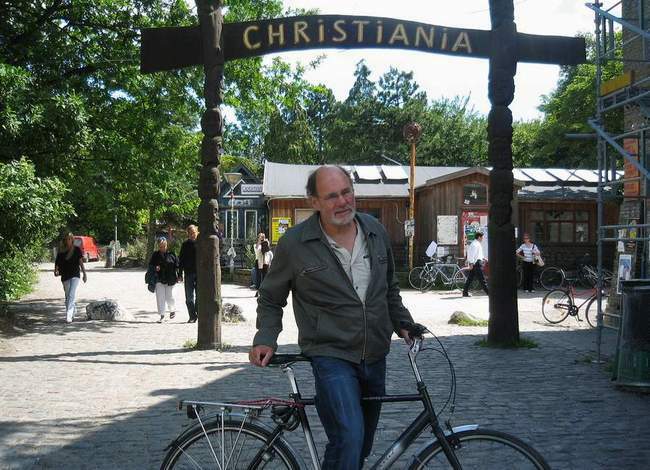 Very peaceful, idyllic even--we always take our guests on a bicycle trip through Christiania when we show them around. Guided tours are also provided by the Christianitters. They only exist by the grace of the Danish government, who COULD close them down at any time. There are also many middle-class Danes who are rather offended that there is a "society of freeloaders sucking away their tax kroner", so the Chritianitters want to maintain an open relationship with the Establishment via good PR. We had an American friend (Hi, Larry!) visiting us a while back, and he wanted to see Christiania because he'd read about it in High Times, an American Marijuana magazine. 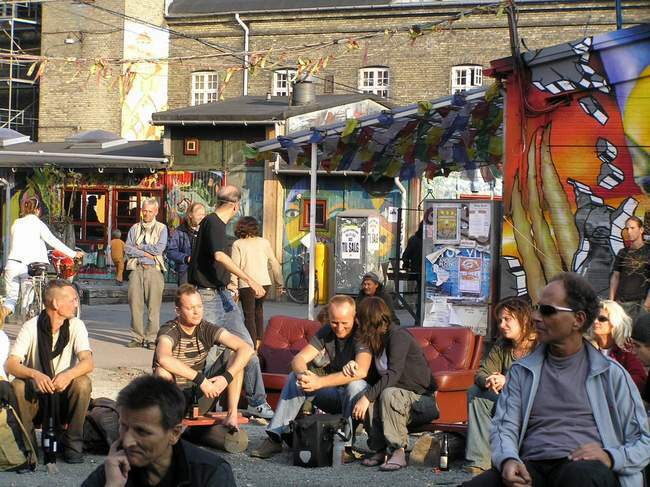 Christiania has been regarded as a Hash-Mecca, rather like Amsterdam, where people are free to smoke dope if they want to. But like everywhere else in Europe these days (and the US), governments are becoming more conservative and right-wing, so there has been a lot of pressure for a "normalization" of Christiania, so Pusher Street has been officially closed down by dramatic police actions... er, several times now. But you can still buy hashish on Pusher Street anyway, you can smoke it openly in the cafes and bars in the confines of Christiania. Although I can't show you a picture of it because the hash-sellers really don't want cameras on Pusher Street... understandably. However, hash is not legal in Denmark, so the police DO make raids into Christiania every now and then: not so much that they really care about people smoking a little pot --there's a grey zone about "acceptable personal usage"-- but they are after the Suppliers, those same old organized criminals making vast tax-free fortunes as anywhere else in the world, who are also involved in prostitution and hard drugs. So watch it. 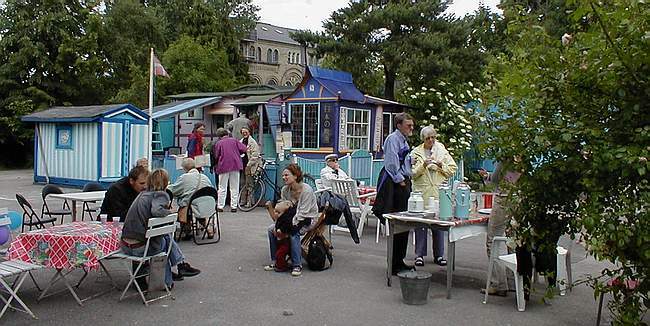 Den Grå Hal (The Grey Hall) is one of the most important buildings in Christiania, the setting for big cultural events, like the annual Christmas Market. 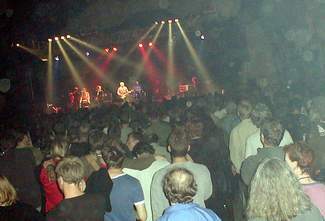 It's simply one big room, and is so cool that this is where Bob Dylan prefers to give concerts in Denmark. In fact, the scene to the right is from the "Dylan's 60th Birthday Jam" ...hmm, why is it so hazy in there? The big old buildings were once soldier's barracks, all of which have been converted into apartments, but many hand-made houses have popped in in the open areas between. 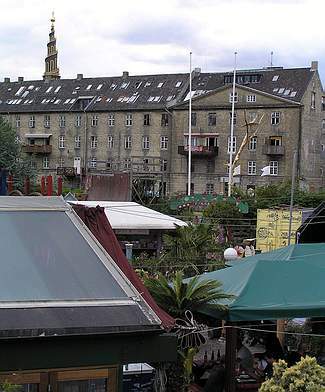 There are several cottage industries going on, bicycle factory and cafe Månefiskeren seen back there. 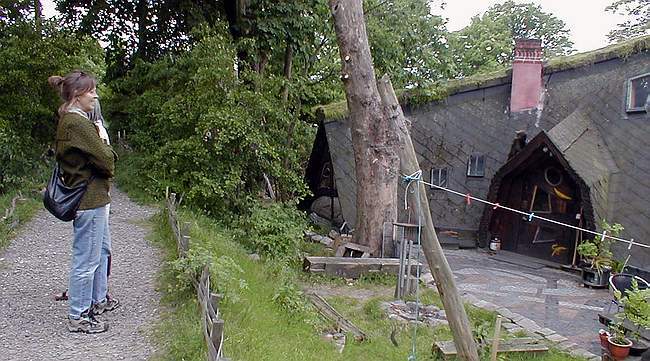 The famous "Banana House", built by travelling carpenters called "navers" on their way through town. Some parts of the area are surprisingly charming, this was once the officers' housing. There are lots of big shaggy dogs in Christiania. 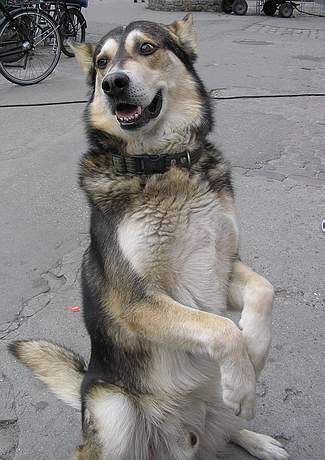 Maybe too many, so some of them have learned to beg in the most professional manner, like this guy. Tolvkanten (the 12-cornered house) is an example of real hippie handcraft and dedication to detail. The same guy built a very interesting pyramid house earlier, but that's gone now. 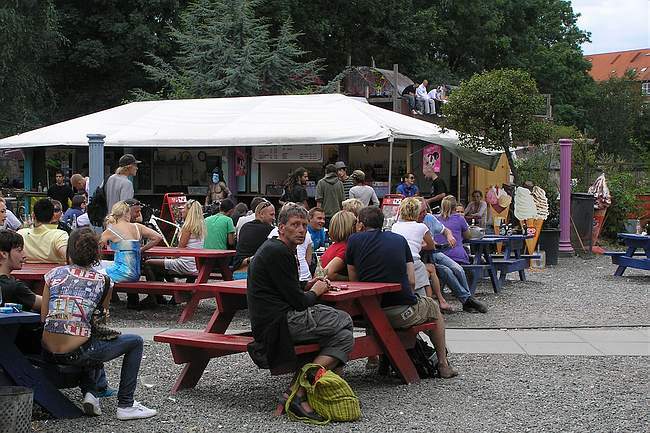 Nemoland is where you can get Real Live Junk Food, like burgers and fries, instead of organic vegetarian stuff like everywhere else in Christiania. Beer and weed you can get everywhere, of course. 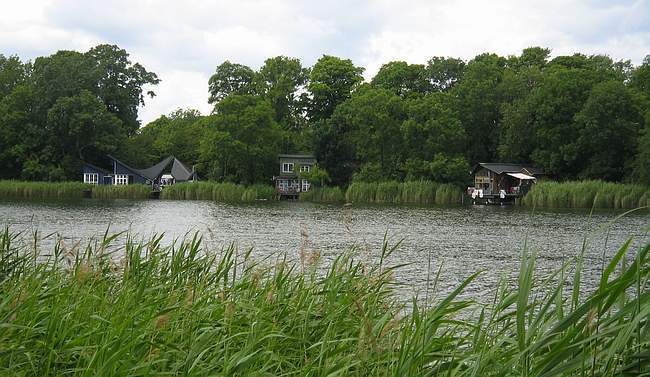 Most of Christiania's land area is actually wild nature, an oasis in the Big City of Copenhagen. 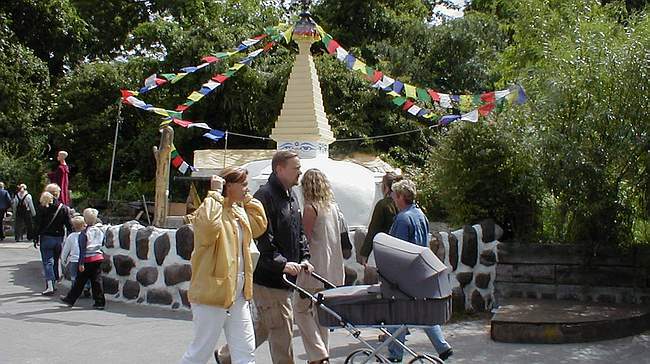 If you're especially interested in Christiania, try the link to their own official web site found on the Kbh Links page.